Joe Sugg Photos, News, and Videos | Just Jared Jr.
Joe Sugg & Caspar Lee Form Digital Talent Management Agency! Joe Sugg and Caspar Lee have a new business venture in the works! The YouTubers have formed a talent management agency with the investment of IMG named Margravine Management. “We have been working in the digital space for over eight years now and can’t wait to combine our experience and skill with the strategic guidance of IMG to offer a new management service and bring about a new era of digital talent,” Joe and Caspar said in a statement to Variety. 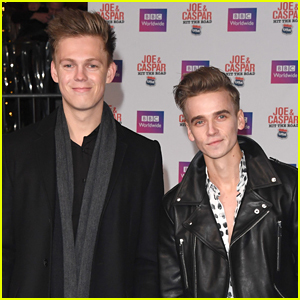 Joe and Caspar named their company Margravine – which is the name of the street the guys lived on in London when they first got started on YouTube. Zoella used her makeup skills for evil (okay, scares) this Halloween by transforming her brother into Pennywise the Clown from It! In the 17 minute long video, Zoella puts red contact lenses in Joe‘s eyes, forces him into a bald cap, covers him with white paint, and covers him with insane makeup and a terrifying red wig. 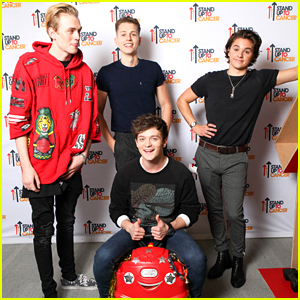 The Vamps‘ Connor Ball never looked so happy while sitting in a pint-sized car during the Stand Up To Cancer with YouTube event in London, England on Saturday (October 15). Joined by bandmates Brad Simpson, James McVey, and Tristan Evans at the event, which started back in September with YouTube pledging 1000 hours of fundraising for cancer related programs through Stand Up 2 Cancer. Joe Sugg, Casper Lee, and Dan and Phil also joined in on the fun event. Dan and Phil also released a song called “The Internet Is Here” and 100% of the proceeds are going to Stand Up To Cancer. See their announcement below! Dan and Phil’s charity single for Stand Up To Cancer! Joe Sugg looks super hot while posing at a photo call for his film Joe & Caspar Hit the Road held during the MIPTV on Tuesday (April 5) in Cannes, France. The 24-year-old social media star was joined by his co-star Caspar Lee. Joe & Caspar Hit the Road follows the YouTube personalities as they go on a road trip driving all around Europe. Watch the film’s hilarious trailer below! Casper Lee Reveals What Happened When He Went Phoneless for a Week! Caspar Lee looks super cute while arriving at the BBC Radio 1 studios for an appearance on Tuesday (December 8) in London, England. The 21-year-old YouTube star was joined by his BFF Joe Sugg. Caspar recently opened up about filming their new movie Joe and Caspar Hit the Road. Joe Sugg and Caspar Lee pose for photographers outside the ITV Studios on Tuesday (November 24) in London, England. The duo goofed around a bit outside the studio before heading inside for a taping. 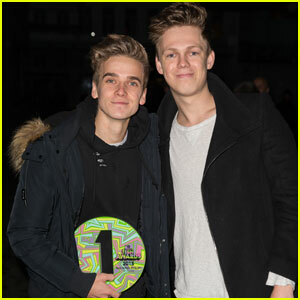 Joe and Caspar are making the rounds to promote their new film, Joe and Caspar Hit the Road. Earlier, Joe posted a hilarious selfie alongside co-star Caspar and comedian Bill Bailey. Joe was thrilled to finally be meeting someone he had grown up watching. “Got to meet the legend that is Bill Bailey the other day! I remember my dad got given one of his stand up DVDs for Christmas many years ago and I loved it so much I ‘borrowed’ it from my dad and never gave it back,” he posted.